Archilogic enables a new revenue opportunity for 3D Tour Pros. All you need are 2D floor plans and Archilogic will create web-based interactive 3D models. You can help property developers 18 months before they even break ground. It's easy, fast and affordable to have Archilogic create interactive 3D Models to help sell a space that hasn't been built. Pricing begins at $30 each within 24 hours with a Pro Membership. If a potential client tells you to come back in 18 months when the community is built, now you have a great solution to begin a relationship 18 months sooner! for info, I have worked with them already, they are really great and doing a fantastic job! I can only recommend them. Thank you, Dan, could not have put it better. Really glad we are officially part of the We Get Around Community now. I am Jan - I help partners get started with offering our Floorplan-to-3D service. There already are quite a few Archilogic partners in this forum, so some of you may know me - possible under my official name "Johannes". If any of you have any questions, I am here to help. @sandyswiss, thank you for the kind words! I've been introduced to the founders of Archilogic by @DanSmigrod a while ago, after expressing my interests about the conversions. I wanted to see if it could be a valid starting point for my 3d rendering workflow. I've been pleasantly suprised by the price/quality after my first conversion. Fellow Dutchman Johannes from Archilogic has been of great help and has been asking me how they can improve their service to better suit my workflow. So I am about to write up a small review on their conversion service combined with my rendering workflow, in the upcomming days. When I go to the landing page for forum members - I see there's a Plus and Pro pricing. Not sure I understand the difference? Or those one time charges for models or monthly prices? Then, I see the example. Is that the exact final product you get for a one time job for $59 if it's under 2,000 sq ft? Where you can walk around inside just like a MP tour? I see the Pro package is less money - guessing that's from paying a monthly fee? It's basically like a MP tour but in cartoon fashion (sorry, couldn't find a better word - don't take it as an insult)? So, this could be just another option for our customers that decide they don't want to do 3D? But then, in order to provide a floor plan, we would have to do a MP 3D scan....just a little confused how to implement such a product. If they already have a MP 3D tour, what's the benefit of having basically the same thing but in cartoon fashion?? Again sorry for that word...I know it sounds awful. I don't mean it to be. Then, do you guys place the furniture in there or is it based on the furniture that's already there? Sorry for the million questions. I love this product...just trying to understand how I can use it and what it will cost me. This is a fantastic service with a great quality end product that our clients love! We are predominantly selling this service to Group Home Builders so that there clients can experience what their new home is going to look like before they even start laying the foundations! @Property3dNZ - so do you do this in addition to the MP tour? Nevermind - I see where you said - "Before they lay the foundation"
I love this product - just trying to figure out how to sell it. I don't work with builders often, so I don't come across homes with floor plans unless I do a MP tour and sell floorplans with it. Then, I am having trouble seeing how I can utilize this product. I'd happily answer a million more questions, no problem. Let me try to clarify things. These prices you see there are all one-off prices when we turn the floor plans into 3D models. So a job under 2000 sq ft would cost you $30 with the Pro Licence active and $59 with a Plus licence active. These licences indeed carry a monthly fee (39$ for Plus, $99 for Pro after a 30 day risk-free trial). These licence fees are for the entire account, irrespective of the number of models. They unlock things like white labeling, faster model creation and in the case of Pro lower the prices per model. I love cartoons, no offence taken at all there. There are people that use our service post-MP-scan indeed, mostly to virtually stage the space, alter the architecture, etc. Show how the space could be, really. Our models are a lot more semantic and interactive than Matterport scans. However, the clearest use case is somewhat different: it is really a parrallel stream of business to cater to property developers,interior planners, renovators, etc. It is not another full-time job on top either: no need to scan, photograph, etc. You simply market the product, place the order with us when you get one, and upsell the result. Matterport pros are often in the position that they have the right contacts already, and for them it is also a foot in the door: you make models into 3D when the space is not yet finished, and come back for scanning later. So: parrallel business, much benefit from offering both. As for the furniture: that is up to you: you can give us renders/pictures/artist impressions/etc and we will use these in our modeling. 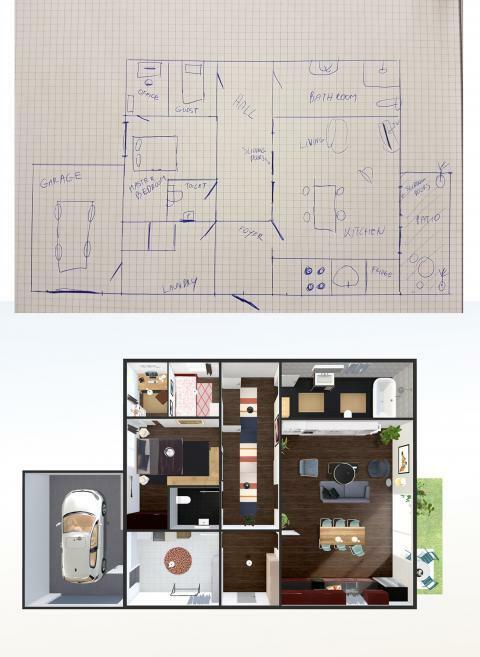 If we just get teh floorplan we can either furnish it (default) or leave it empty if you ask us to. You do raise an important point: you need the 2D floorplan. Some of you may draft these already. In many cases they can be obtained from the client. It depends a bit on the segment and market you go after. @pixelray - Hi there we offer a whole range of products with MP and Archilogic being some of the main things I look after. Archilogic has been a great way to make some extra money for the business with not a whole lot of effort on our behalf! @Property3dNZ Also: the 15% off models action for WeGetAround Basic, Standard and Premium members obviously also applies to existing partners Just use that voucher code generation form by Dan. @Jan_Archilogic Ha ha ha thanks for that! Ok - thank you...that answered a lot of my questions. I guess one more question would be - why the monthly fee? What about someone like myself that may need something like this from time to time - but not often? For example, I have a client that buys homes and fixes them and re-sells them. He uses me for before and after 3D scanning just to show off what they did. They will take out walls and do all types of things when they refurbish these homes. You said it's used to "alter the architecture" - so how could a home re-modeler use this product? Could it benefit someone like that? Then, if it could benefit them; I only do a few jobs per year for them...again, I get stuck with justifying a monthly fee. Sorry...just being honest. Is there access to this product without a monthly fee? @property3dNZ - can you send links to some of these please? I would love to see how you put these out there. THanks! @pixelray I sent a PM through! I understand your point. Let me explain where we are coming from there: many of our costs associated with models are ongoing. We wanted to steer clear of complicated hosting fee structures, and instead went with this. The other argument is behavioral: this is higher risk higher reward when compared to a hosting plan variable on the number of tours you have. This is intentional: we work with white labeling partners and do not want everyone to start offering us and compete each others margins away. Only the people that expect decent volume, and put in the (marketing) effort to generate it will do great. This does not exclude single photographers though: we have seen quite a few one-man businesses take it up. So to make this practical: you could model the space pre-renovation (furnished or not). Then you can change the wall layout, build an extension, and what not. Save a copy of the model and share that with him again (possibly charge him for this second version too). There are many possibilities, but let me send you quick PM as well. As for your last question: there is access to this service without the monthly fee: per model prices are the same as with the Plus account. However, that does make things a bit more complicated to up-sell, as the licence perks like white labeling are not included in that tier. Thank you. I appreciate all the time you took to help me understand everything. Question Jan: you generate a 3d model from a floor plan which is a fairly standard work-flow. Can you, will you accept a Matterport 3D .obj file as well? I would assume this would easier on your end- yes? Using Matterport OBJs as only input is not something we can do yet actually. You can give us a link to the Matterport Tour as extra reference, and we can style and furnish the place using that input. For the time being, we still need a 2D floorplan though. If this is something that many of you would value (Archilogic models directly out of Matterport scans), please let me know (up vote, post, PM). There is already some R&D going into creating models out of point clouds, so any input from you can only make the solution better and speed up the process! One other thing btw, for those fearing that we require a professionally drawn floor plan, and also @pixelray , I actually ordered a model last night from a drawing I made. The layout itself is terrible (no architecture or interior design skills here), but it does show the principle. So, how do you get your first client - without revealing that you get this service from Archilogic? Use these non-branded examples – embedded in your website. These examples are for Basic Standard and Premium Member of the We Get Around Network.